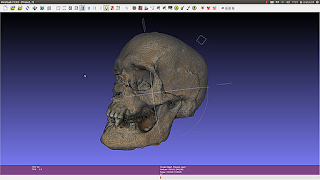 Although it have a couple of tools that aid archeologists today, unfortunately for us, defenders and enthusiasts of free software, the majority of them are proprietary software. 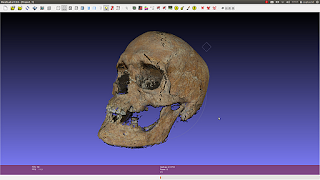 It is really important to have access to open source tools, since they can make a bunch of projects and research fields more feasible and less spendable. Here I will expose how this could be achieved using some of them to do forensic facial reconstruction. 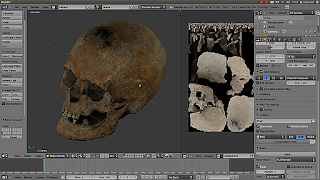 We have several good software, like InVesalius, that helps us converting computed tomography in 3D meshes. The problem is that is very expensive to make a tomography and some workgroups don't have neither acess at this tool, or money to invest of this projects making unfeasible the whole work. Since you have the reconstructed skull, and if you have the knowledge to make the reconstruction, is quite easy to make the rest of the work, because we have Blender to make 3D modeling, Gimp to make the textures and treat the image, and a couple of other software to finish a well made work. 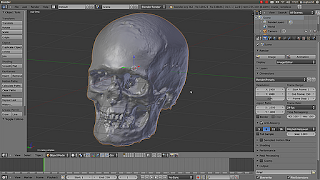 I already have done some facial reconstructions using only free software, but this is especial, because for the very first time, we used SfM in the process. The ARC TEAM was able to reconstruct a skull with a series of pictures with great riches of details. This is very important because the process is now viable to be used in all regions of the world, mainly by those groups doesn't have a lot of money to spend, but have a computer, a picture machine and a big wish to make things happen. 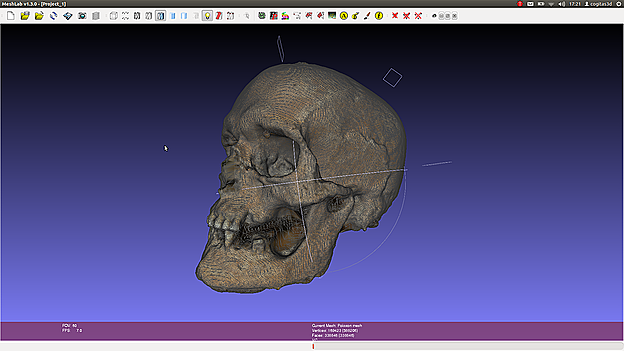 The first step consists to get the skull to reconstruct. 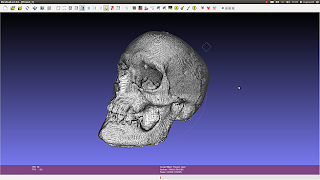 Once that I got the points cloud of the skull, I opened it on the MeshLab. 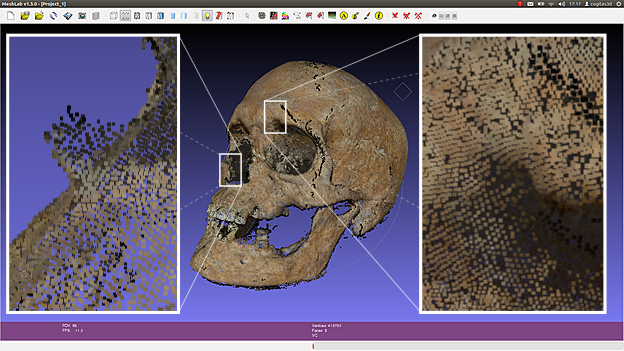 I converted the points cloud in a mesh using the Poisson algorithm. 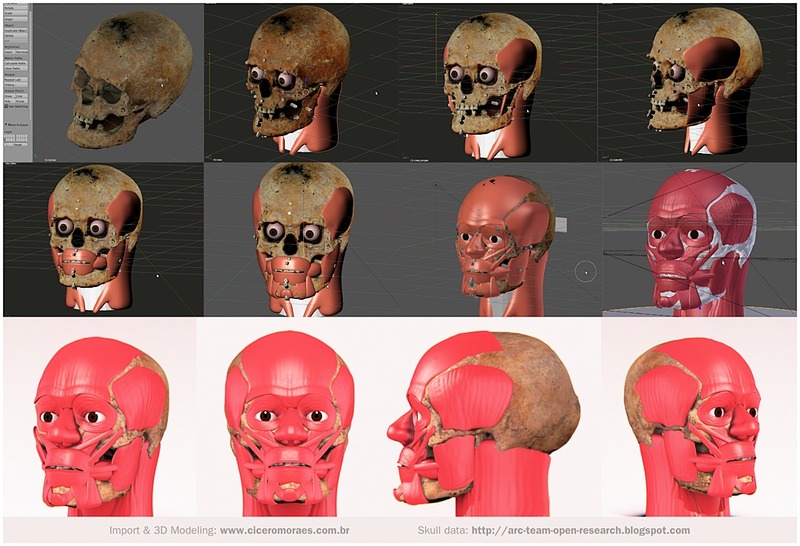 The quality was pretty good, but when you reconstruct a face, you have some informations that appear in the texture of the skull. With the Poisson, you have only the mesh, without the details of the color and the texture. 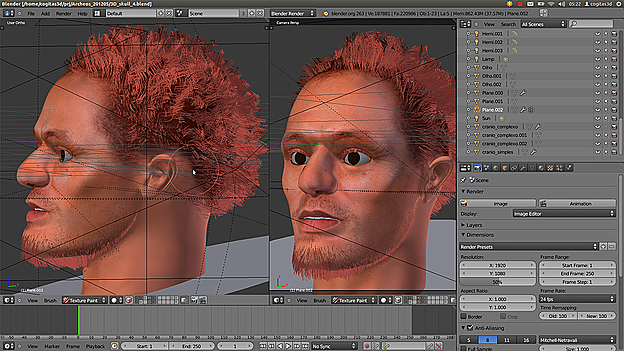 To "paint" the mesh I used a MeshLab command called "Vertex Attribute Transfer". 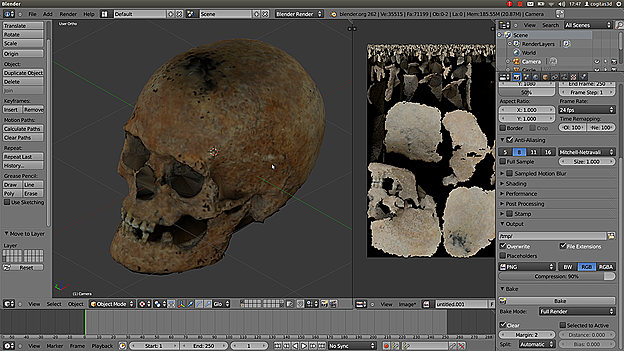 With the skull properly reconstructed and textured, I imported it on Blender. I made a previous study, using the Inkscape to see the way to go through. And I made the reconstruction of the face. 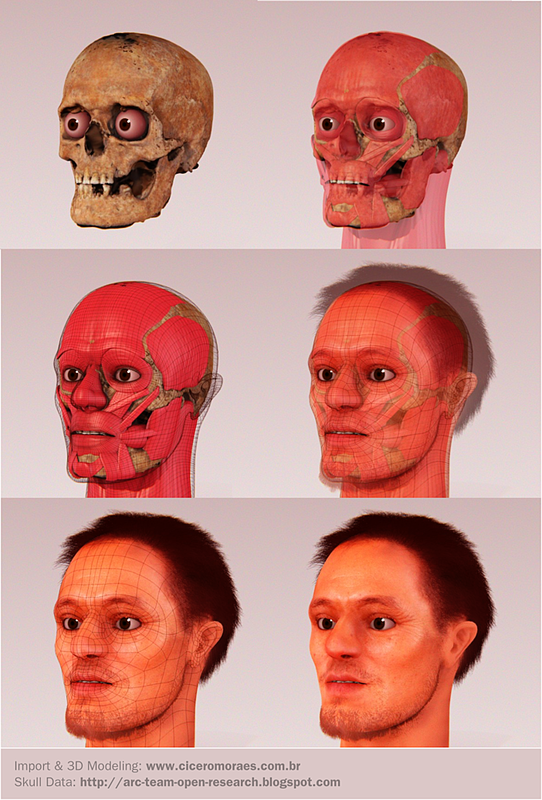 Using a mix of american method (Taylor 2001) and the Manchester method (Wilkinson 2008) positioning the tissue depth and reconstructing the facial muscles. After to modeled the muscles, was the time to modeling the skin. Using the skin configuration of a caucasian male, the face texture was created and the hair too. 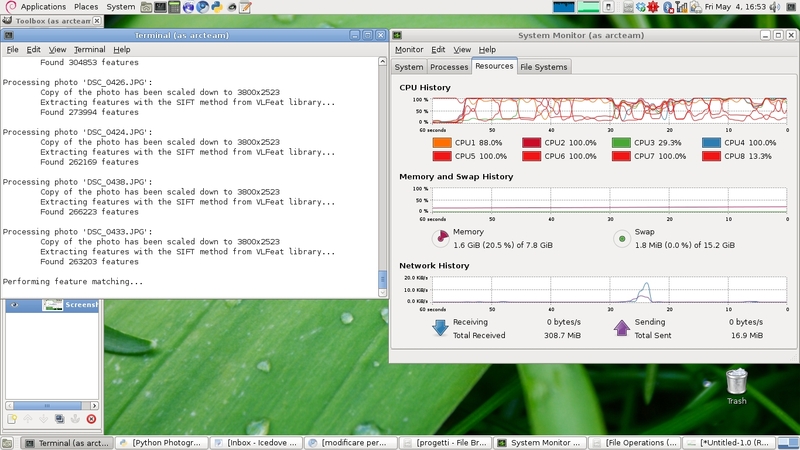 OS: Linux Ubuntu 12.04 (I would use Archeos, but I like to use 64-bits version in my notebook, and the current Archeos version is only 32-bits). With this case was showed that is possible to make good reconstructions using only free and open source software. I hope the information be useful for you. Thanks for the attention, good studies and have a nice day! Finally, after a bunch of months of work we're proud to announce the release of ArcheOS 4 Caesar beta! been done in software choice and reliability from the alpha release. You're all invited to download and test it, and to notice us any issue on the official project page. As usual, the file to download is available on the download page of our website. installer to copy ArcheOS on your computer. time (the file is up to 2GB) or if the connection will be interrupted. To contact us: please use this mailing list! Once again, thanks Fabrizio for your work! 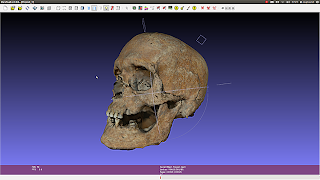 As I wrote in a previous post, ArcheoFOSS workshop will be held in Rome this year. 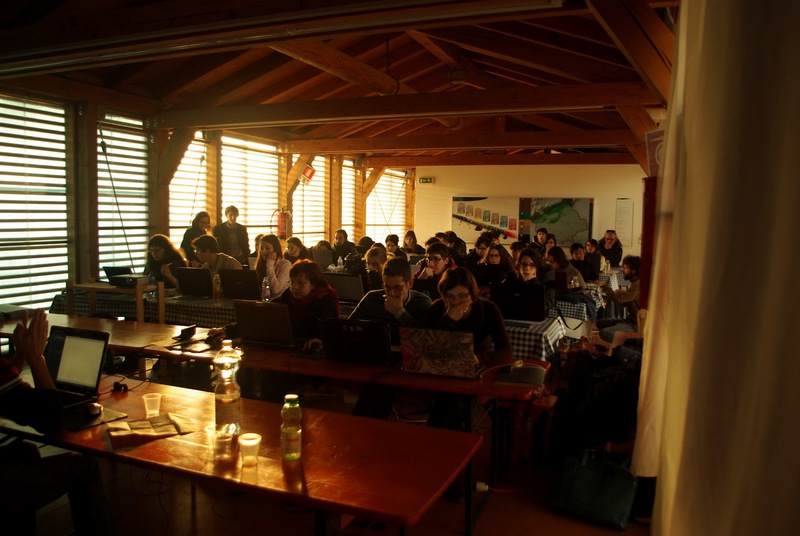 The organizing committee is preparing an "OpenLAB" session in which is planned also an introduction to ArcheOS. The session will be Monday, June 11 and should last a couple of hours. 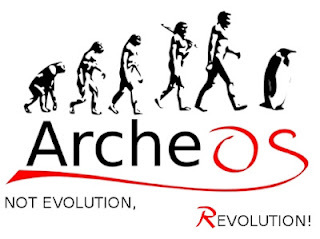 Since the time is short for a detailed presentation of ArcheOS (it would take at least 2 or 3 days...) I would like to focus on the most interesting topics for the participants, so I ask your help: if you are in Rome between 11 and 13 June and you want to join ArcheOS OpenLAB, please let me know which kind of arguments you would like to learn more. If you do not know very much about the system, just surf in this blog and read some posts; most of them are related with ArcheOS. 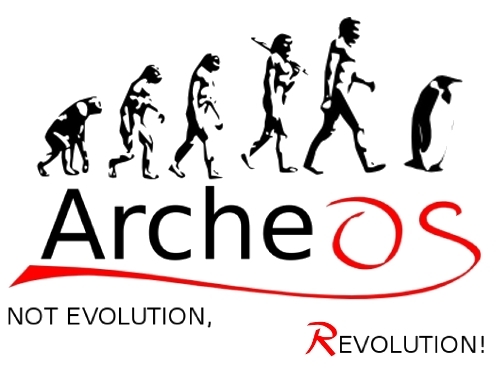 You can also check ArcheOS official website, look the screenshots and get an idea about its potentialities and about all the archaeological software. To let me know what are your main interests simply leave a comment to this post (please mind that the time is short and I would like at least to show a general overview of the system and to spare some minutes to show a preview for the next release). 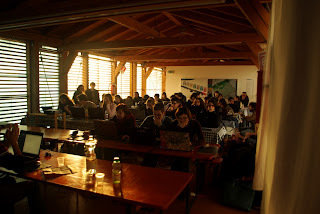 The photo below shows the last basic course of ArcheOS we did in Livelet archaeological park. 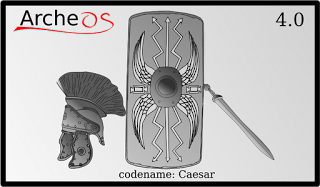 thanks to the effort of Fabrizio Furnari, ArcheOS 4.0 Caesar is now in a development freeze, which give us the possibility to test hardly the distro before the beta (stable) release. We plan to accomplish our checks in a couple of days, in order to upload the final iso image during the week-end. To have a (hopefully completely working) preview of ArcheOS 4.0 beta it is possible to follow the instructions Fabrizio wrote in the readme file on github. We hope to give you soon good news about ArcheOS stability and to start with Theodoric development! For ArcheOS 4.0 alpha users: soon a complete list of the package to update.